Vertical Blinds are known because of its flexibility to cover large size and different shapes of windows perfectly without a glitch. It is a popular choice for long and wide windows, which are commonly the conference window, sliding door, stair window, etc. The durability and functionality are also well proven and tested and in its very affordable price. 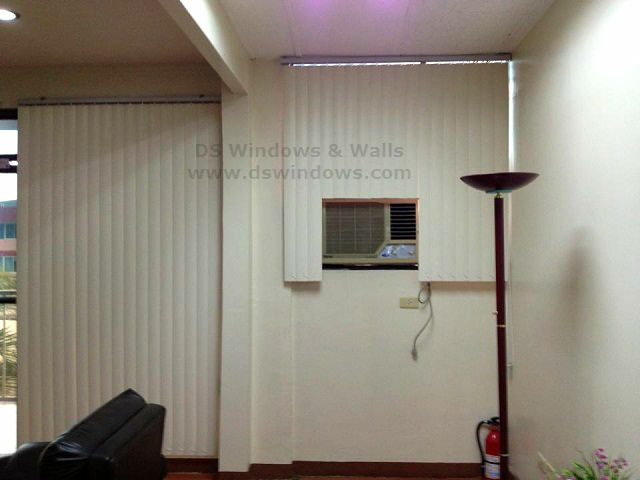 Our client in Naia Road, Pasay City opted for PVC Vertical Blinds for their office. They used it in their window which has an air-con installed in the bottom part. Some of us commonly install air-con inside the opening of the window, thus, limiting the possible window dressing that will fit on it. One of the best window cover for window with irregular shape is PVC Vertical Blinds. It is the only blind that consists of vertical blades, which can be cut, to fit on the irregular shape of your window. 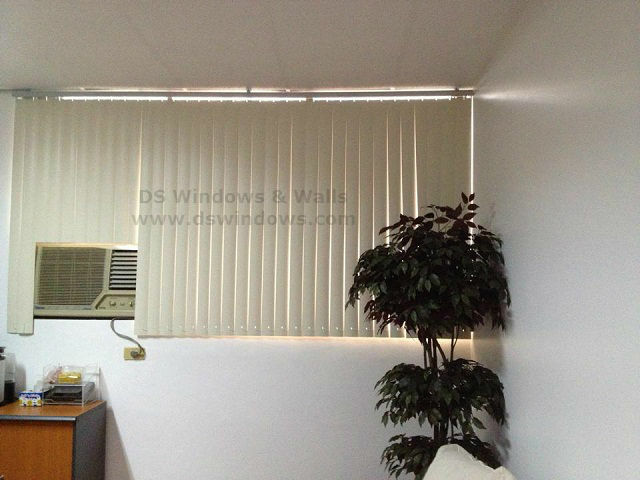 In DS Windows & Walls, we made customize blinds according to your window size. If you have any inquiries, just visit our showrooms at 2nd level Pacific Mall Lucena City, 3rd level Robinsons Metro East, Pasig City and 4th level Waltermart, Makati City or email us at inquiry@dswindows.com for. You can also call us at (02) 893-1373 / (02) 403-3262 / 0916-311-3909 for more details.